Successfully Added Car Audio Entertainment System 1 DIN - 50W x 4 to your Shopping Cart. Car Audio System for spicing up any car with super 50W x 4 sound output in single DIN size (50mm tall). 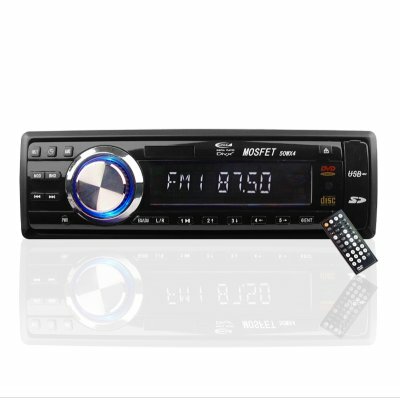 Not only will you be getting great music from FM/ AM Radio and CD's, but with the AV OUT, connecting the 1 DIN Player to any size LCD Screen for playing DVD's is both easy and less expensive than buying a Car DVD Player with a screen pre-installed. Also featured is a USB port and a SD card reader for playing all of your digital movies and music with the super sound available though this Car Audio System. Single orders of this wholesale item are no problem here at the original home for factory-direct Chinese electronics, Chinavasion. Get yours today!